Polaris® ATVs were built to work as hard as they play. Mettler Implement carries all the latest models from utility to sport & mud to the recently introduced Polaris ACE® - designed specifically for children. Stop by our Mitchell or Menno locations in South Dakota, and we'll help you find the perfect Polaris® ATV. When you’re craving a new way to enjoy the outdoors and experience nonstop thrills, you might want to consider investing in an ATV. These vehicles are built for pure power and speed that can be enjoyed on those exciting off-road trails. If you’re ready to make some unforgettable memories with an ATV, visit us at Mettler Implement to check out all the models we have for sale. You can find us at our locations in Mitchell and Menno, South Dakota. We also proudly serve Parkston, Tyndall, Freeman, and Wessington Springs. If you’re not familiar with the term, ATVs are all-terrain vehicles that are designed to handle rough rides with ease. These impressive off-road vehicles come with massive engines, big tires, and outstanding performance. ATVs are four-wheeled vehicles, which is why they’re often referred to as quads. An ATV operates like a motorcycle in the sense that you straddle the seat and control the direction and speed with handlebars. If you’ve only ever ridden a standard bike then learning how to ATV shouldn’t be too difficult, but it will require some practice. Although these machines are very versatile, they come fresh out of the factory equipped to handle specific types of terrain. For example, with the heavy chassis and large tires, you’ll be well-suited for riding on dirt trails or other compact material. On the other hand, these qualities can make ATVs less ideal for softer terrain, such as gravel and sand. This isn’t a deal breaker because you’ll have access to loads of parts and upgrades, so you can make sure your ATV is ready for specialized riding. If you know from the start that you’ll need specific parts for a certain type of riding, you can look into models that are built with the parts already installed. This will provide you with features you need, like lighter weight and thinner wheels. Hitting the trails is one great way to enjoy your new ride, but there are other options you might also find appealing. Many ATV riders use them solely for utility purposes. There are specific models that come with superior towing and hauling capabilities, plus additional storage and more power. This allows you to use your ATV for heavy-duty work tasks. You’ll be able to navigate around your property with ease, cover more ground in a short time, and transport materials and supplies without any hassle. Hunting is another popular use for ATVs. Those towing and hauling capabilities are perfect for handling all your equipment, tools, and game. They especially come in handy for hunters who like to enjoy overnight trips since there’s more than enough storage space for camping gear. You can choose a model that comes with featured designs to help with hunting, like a camouflage paint job and convenient gun rack. 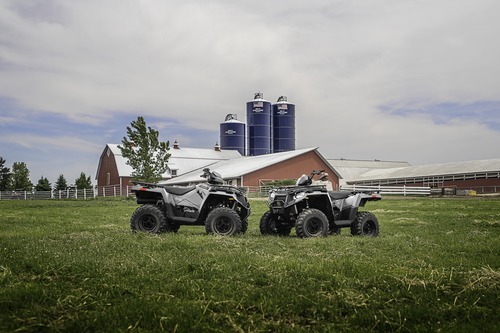 Stop by Mettler Implement today to check out our amazing selection of ATVs! We also offer service, parts, and storage. We have two locations in Mitchell and Menno, South Dakota. We also proudly serve Parkston, Tyndall, Freeman, and Wessington Springs.